When it was announced that Season 6 of the popular poker show, High Stakes Poker, was going to air on Valentine’s Day 2010, forums were alight with excited posters wondering which professionals would feature over the series. However, the excitement and joy quickly turned to despair and sorrow as it was also announced that one of the co-hosts, AJ Benza, would not be returning to the screen, instead Gabe Kaplan would be joined by Kara Scott instead. While Miss Scott is a top presenter in her own right, having extensive broadcasting experience through the European Poker Tour and World Series of Poker Europe shows, many saw Kaplan and Benza as a great comedy double-act who bounced off each other and were part of the reason why High Stakes Poker is so popular. The worlds busiest poker forum, TwoPlusTwo, saw a thread created that so far has seen over 400 members post their support for AJ Benza and a poll shows that if a petition was drawn up to reinstate Benza that he would win by a 9:1 margin, which is huge support. Whether or not any petition handed into the show’s producers, GSN, would make any difference remains to be seen but Benza must take some comfort in the fact he was, and still is, extremely popular to the poker masses. 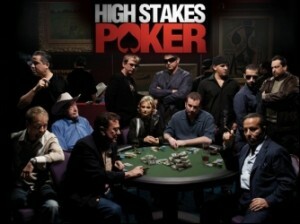 High Stakes Poker was first aired in January 2006 and was an immediate success with fans across the globe. The main draw of the show was the fact each of the top players were using their own money and often sat with $200,000 or more in front of them, which created some very large pots, most notably the $575,000 pot between Gus Hansen and Daniel Negreanu and more recently a $919,600 pot won by Tom Dwan against Barry Greenstein. Definitely not pots you would see at your local pub poker or home game! Season Six will see the likes of Doyle Brunson, Daniel Negreanu, Phil Ivey and Phil Hellmuth do battle in a real-life cash game where the minimum buy-in is $200,000. Players can choose to rebuy if they wish or leave at any point with or without their chip stack intact. If you are looking to build a bankroll like the players who play in High Stakes Poker, you should check out TopOnlinePokerSites.org and find out where the fishiest poker sites. This entry was posted on Monday, February 22nd, 2010 at 10:24 am and is filed under Poker News. You can follow any responses to this entry through the RSS 2.0 feed. You can leave a response, or trackback from your own site.